I hope all the students and teachers have taken advantage of the wonderful "March Madness" at Gary's Barber Shop on Main Street in Mason. Every Wednesday in March they have been giving $3.00 haircuts to students and teachers. The money made goes to their own, Joel Brown, Elizabeth Lothrop, and Kortney Snyder. All three kids attend the Mason Schools. Randy has gotten his hair cut there for the past 14 years and now takes our son, Jim. Thanks to all who work there and make it possible. 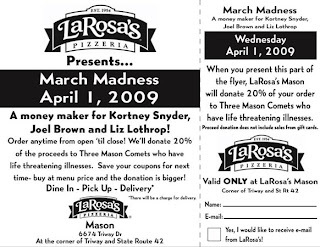 Another fundraiser is LaRosa's. The entire day, April 1, LaRosa's will be giving 20% of your bill back to these three wonderful kids. If you go back at dinner they will even give an additional percentage off, just show your receipt from earlier. Once again, here is our community doing what it does best; giving back to their community. Thanks LaRosa's. Print off the coupon and take it in with you when you dine in or carry out. I pray that Gary's will get some new lasting business from this and that LaRosa's will also gain new customers. God does bless those who give. Thank you for your generosity to our families. Is this just the Mason location of LaRosa's? We usually go to Lebanon, but could easily make the trip over there! I asked the amazingly accommodating manager to open up so all of our lunches (teachers) can order. She did! So, hopefully it will be packed for lunch as well as dinner! I guess i know where im eating dinner on Wednesday!! !